I’ve been going though a bit of a beetroot phase recently, it’s packed full of loads of healthy vitamins and minerals and you can put it in everything from salads to cakes. I like to cook my beetroot by cutting off the leaves, wrapping them in foil and baking them in the oven at 200c for 1-2 hours or until a knife slides in easily. Then let them cool a little and peel them. 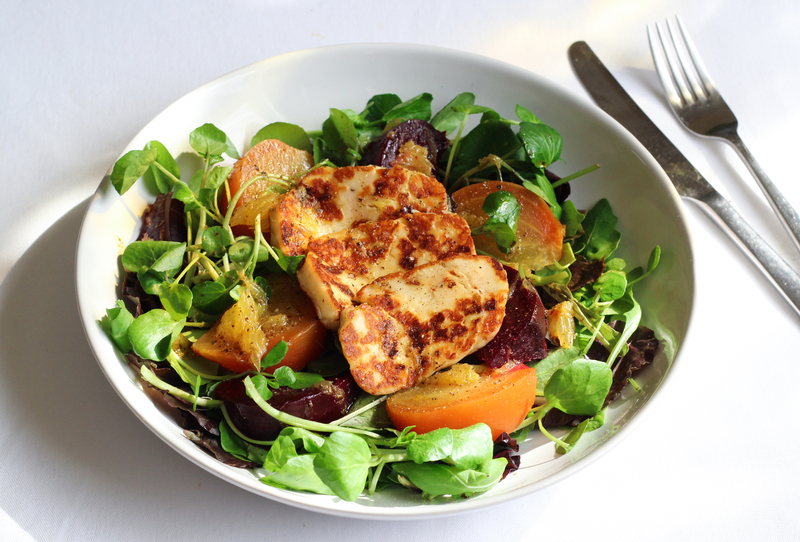 This recipe uses beetroot and halloumi (which I like to call squeaky cheese). The yummy salty cheese goes really well with the sweet beetroot. It makes a great light lunch, something I need this week after a weekend in Hay on Wye for my husband’s birthday. Slice the halloumi into 6 slices and place in a griddle pan over a medium heat. Cook until golden brown, turning halfway through. Meanwhile split the salad leaves between two bowls, slice the beetroots and put on top of the leaves. Top with the cooked halloumi, drizzle over the dressing and enjoy.